"The best in the city, simply that." "That's why we always come back, to share the experience with everybody else." "This is my first time." "It's definitely the best quality of chocolate." Definitely iconic, yeah." "For us, Ghirardelli's is a tradition." "It's really hard to find hot fudge in the city, so I saw it on the sign and I was like, 'We have to go- I need hot fudge, like we need to go there.'" Ghirardelli Chocolate has been serving top quality products for over 160 years. Bringing tradition, magic, and true chocolate flavor to generations. Inspired by the same freshly-made, authentic recipes served in our renowned ice-cream shops. Introducing new Ghirardelli hot fudge, made with real Ghirardelli milk chocolate. Rich, thick, and chocolatey. 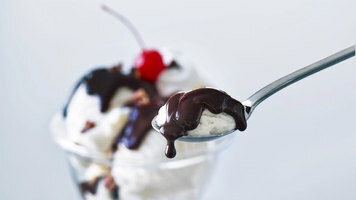 Ghirardelli hot fudge is perfectly crafted. From quality sundaes to perfect beverages, you can create an entire array of memorable, indulgent experiences. Crafted with premium, quality ingredients such as milk chocolate, real cream, sugar, butter, and vanilla. Our new hot fudge continues the tradition, heart, and passion of Ghirardelli. 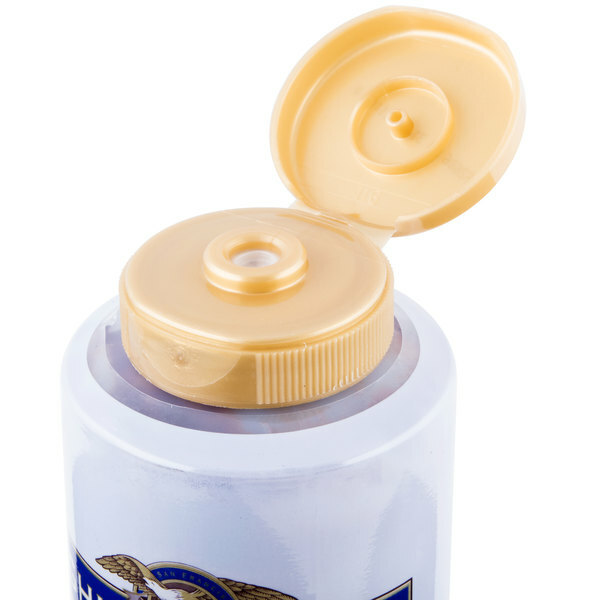 From the classic #10 can format made to fit high-volume operations to squeeze bottles, to smart and sustainable pouches, the perfect way to serve hot fudge has never been easier. "Scrumptious." "That's the best chocolate." "Good." "Delicious." "Good." "Decadent." "Scrumdiddlyumptious." 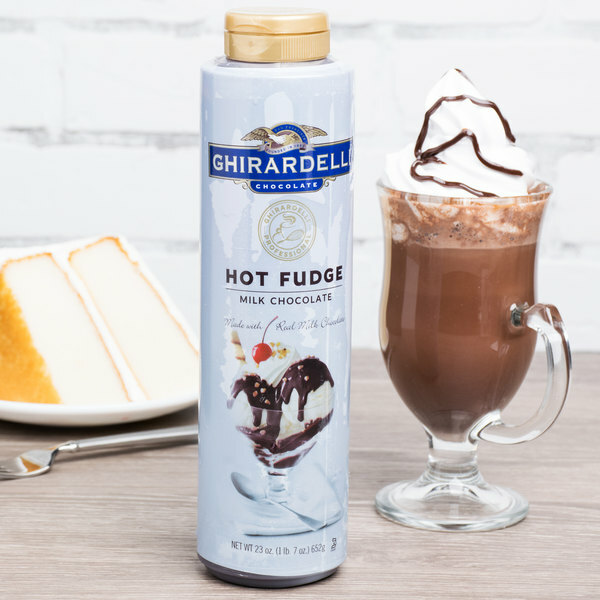 Enhance all of your favorite desserts with Ghirardelli's signature hot fudge. Made with the same quality ingredients as other Ghirardelli favorites, this hot fudge will delight your customers and keep them coming back for more! Whether you're making milkshakes or ice cream sundaes with all of the toppings, your patrons won't be able to get enough of this Ghirardelli milk chocolate hot fudge! 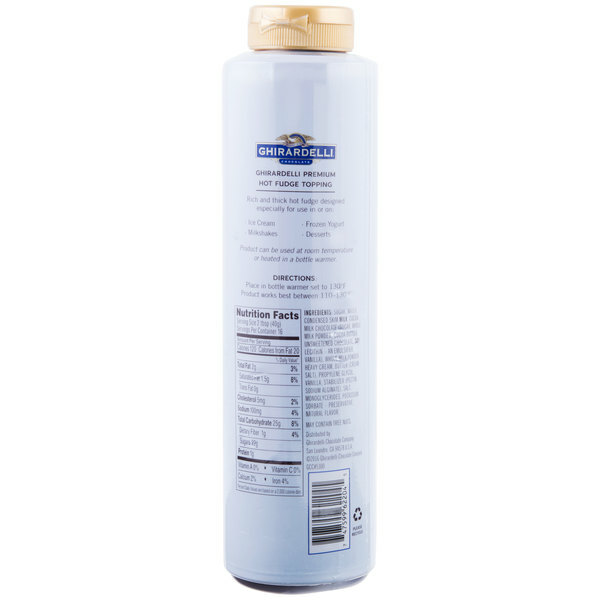 Ghirardelli's authentic, renowned recipe is made with real milk chocolate, cream, sugar, butter, and vanilla. Plus, it includes no artificial flavors or colors, no high fructose corn syrup, and 0g trans fat per serving. The thick and rich texture paired with the creamy, fudgy flavor will upgrade any specialty coffee drink or decadent dessert. Use it for topping cakes, brownies, or classic sundaes. Not only does it enhance the taste of your tempting treats, but it also improves the look and presentation of your offerings to delight patrons and help boost impulse sales. In a convenient squeeze bottle, this fudge can be used at room temperature. For a hot treat, you can also heat it up in a bottle warmer and drizzle it over ice cream or cake. Customers will recognize and trust the Ghirardelli name when they see it in your cafe, coffee shop, ice cream parlor, or restaurant. Ghirardelli began with a young Italian chocolatier in the early 1800s and is now a brand widely known for its rich flavors. This sense of quality is the result of Ghirardelli's commitment to control all steps of the chocolate-making process, from roasting the cocoa beans, to refining the product for smoothness and well-balanced flavor. In addition, the company understands that sustainable sourcing and knowing the origins of the cocoa beans speaks to the quality of the finished product. No matter what dish or drink you prepare, guests are in for a treat with this milk chocolate hot fudge! This is the best tasting Hot Fudge we have ever used. We have tried numerous brands and this is hands down the best. You can get cheaper fudge in larger quantities but if your looking for taste this is it. I wish it was sold in a larger size. This product is definitely what you have been looking for if you want a REAL hot fudge that tastes like high-quality milk chocolate. I always use it on ice cream and fruit - it simply adds another dimension to your dessert. I highly recommend it. I was hoping to love this since it was made by Ghirardelli but the “love” just wasn’t there. It was ok but the taste was just off and I’m not exactly sure why... maybe it’s where I tried it cold and not heated... but this girl was impatient. Ha! Dream of a tall white Ghirardelli chocolate bottle on your counter and feel how your customers are staring at this beauty while you are dripping chocolate. 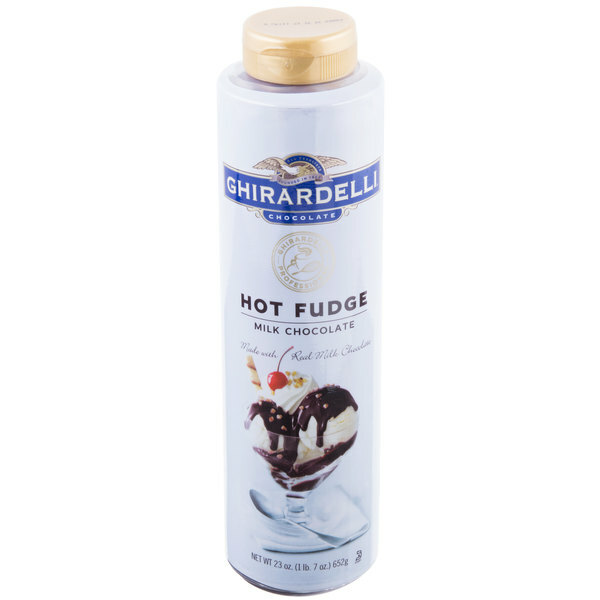 This ghiradelli milk chocolate hot fudge is in a really nice and convenient squeeze bottle. Ghiradelli chocolate is always delightful. This is perfect for cholate milk, shakes, and pretty much any dessert! Makes a great Ice Cream sundae topping without the heat. Allows the look of a hot chocolate sundae without the risk of little people burning their little tongues. Great purchase and doesn't seem to clump in the bottle like most other brands. I bought this for ice cream sundaes yum! Our whole family loved it. It’s also very easy to warm in the bottle. Nice rich thick chocolate topping. I love the fact the fudge comes out really easily with just a firm squeeze. No need to really warm it up first. The taste is good but not as great as other Ghirardelli products I’ve had. I am in love with this hot fudge from Ghirardelli. The hot fudge tastes amazing and is so easy to dispense. No more messes and fighting with jarred hot fudge. I am so happy with this purchase. I can not think of anybody that does not like hot fudge. It is absolutely delicious and it is a perfect add on to any ice cream or dessert. Super delicious hot fudge sauce. Same one they use and sell a Ghirardelli stores for a fraction of the cost. Great on sundaes, to top cream pies, etc. A very high quality chocolate fudge sauce in a great squeeze bottle. I love the taste and price of the product. It is a fan favorite for sure. I am so excited to use this for my next cupcake decorating class where we are making Sundae cupcakes. I know the kids will love having real fudge on their creations.